Thin Layers - No matter where you are traveling, someplace warmer or colder, wearing layers on the plane is a must do for me. The temperatures while flying can be so unpredictable that I always make sure that I am able to shed or add a layer. A chambray top is always one of my go-to pieces for layering since it helps build a put together, classic outfit & I always carry a light weight shawl or scarf in my tote! Sneakers/Flats - While in the airport, you may be walking or standing in line quite a bit, not to mention, you have to remove your shoes to go through security, so ditch the heels this time and opt for a comfortable pair of sneakers or ballet flats. Large Tote - Since each traveler is only allowed 2 carry on items in total (& one is almost always my suitcase), I bring an extra large tote bag on the plane with me. This tri-color tote is sleek and stylish and holds everything from snacks to magazines for my flight. Bobby Pins - Keep your hair styling simple on your travel day & avoid too many bobby pins. Even though they are small, they could set off the metal detector! Flip Flops - Think about how many people stand in the security line at the airport. Now, think about swapping feet germs with all of them - GROSS. Wear a pair of sneakers that require socks or at least carry a pair of socks in your tote so you can quickly put them on when it's time to walk through security. Bonus Points: Socks keep your feet warm on the plane! Too Much Jewelry - While a little sparkle jazzes up any outfit, it could set off the metal detector & isn't always the easiest to remove with short notice. Your best bet is to pack your jewelry in your carry on bag & put it on once you arrive at your destination. What does your airport outfit look like? Meet our co-host for this week's Start The Week Stylish linkup: Annessa from Seeking Sunshine. Originally from Washington state, Annessa is a fashion blogger currently based in Germany! Annessa uses her blog to share her love of fashion, beauty, design & travel. Be sure to stop by her blog his week and say hello! Last week, we loved the way Rebecca from Red Tag Chic LA & Jalynn from The Red Closet Diary styled the color green. aw I think flip flops / slip on shoes help! I like to walk on the sides of my feet, though haha. If I wear socks, I change them out. you are brave! With so many feet & shoes at the airport, I don't want to let my feet touch that floor! Awwww thanks for the feature Michelle - so sweet! And how you look so comfy chic in your travel style too - Have a lovely week ahead! I hope you're heading somewhere fun! Perfect traveling outfit, so cute!! Love this post! So true. This look is perfect for travel! I wear a very similar outfit to yours when traveling so I agree with your tips. A large tote bag, sneakers with socks and a huge scarf are a must. I don't get it when people wear a ton of jewelry and tingle like a Christmas tree. Anyway adorable tote, the pastel colors are perfect for Spring. I own its red version. Happy first day of Spring and welcome back! 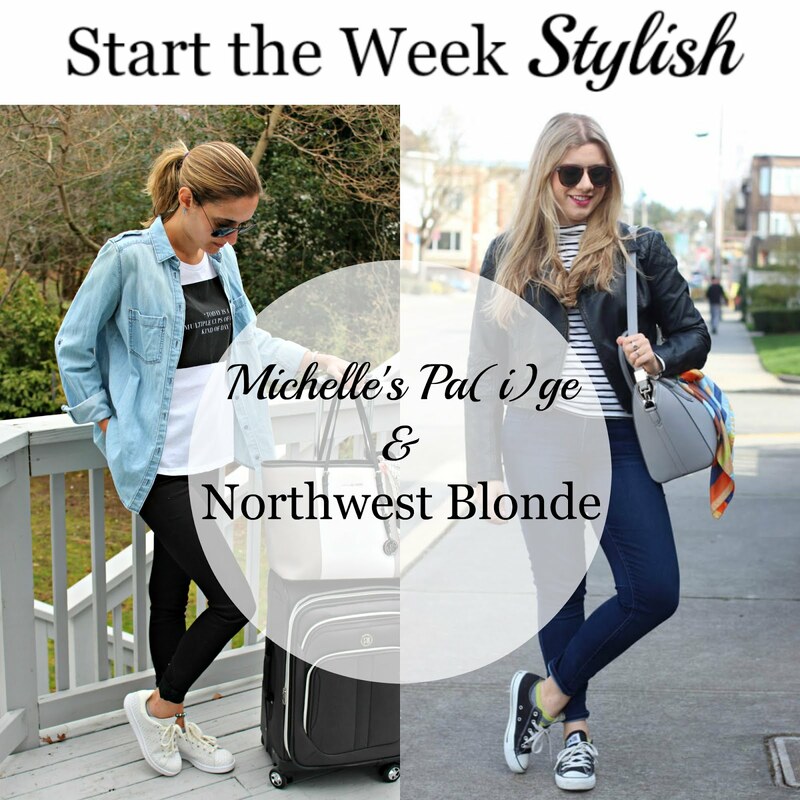 Yes - sounds like we are on the same page when it comes to travel style! Great airport tips! Love your airport outfit and tote too! Couldn't agree with you more regarding best and worst airport outfits. You look so adorable and comfy, perfect traveling look. Hope you had a wonderful vacation! I've always wanted to do a post like this!! It's awesome!! Totally chic and comfortable still! You should! I love reading other people's tips & tricks for styling looks! Great post! I do the same-- dress in comfy layers, wear shoes that can be easily removed, and bring a large tote on the plane with me (yours is so cute!). This is the perfect plane-ready outfit. Yes -getting through security can be a hassle if you aren't prepared! Definitely agree with all your tips! Thin layers are key! A large tote is so key! And statement jewellery is a bad idea. I've definitely made that mistake before haha. Me too - I used to wear arms full of bracelets no matter what. Now I limit what I wear & bring the rest! Dude, your scarf and shirt are so awesome. I totally need both of them! Will take this advice for my upcoming travels this week! Thank you! The scarf has been a favorite for a while. I linked to the exact one! Such a chic and relaxed look! That is such a cute shirt and what a perfect and stylish outfit for the airport. We are going to be flying to Italy in July and this gives me some ideas! Wow what a great trip! You definitely need a comfy outfit for that long flight! This is such a cute travel outfit! I love these tips, and totally agree with the jewelry tip. I can't tell you how many times I have set off the detector with my jewelry! I learned my lesson and keep it in my carryon until I'm at my destination! Yes, yes! Me too! I always try to pack my jewelry instead of wear it! 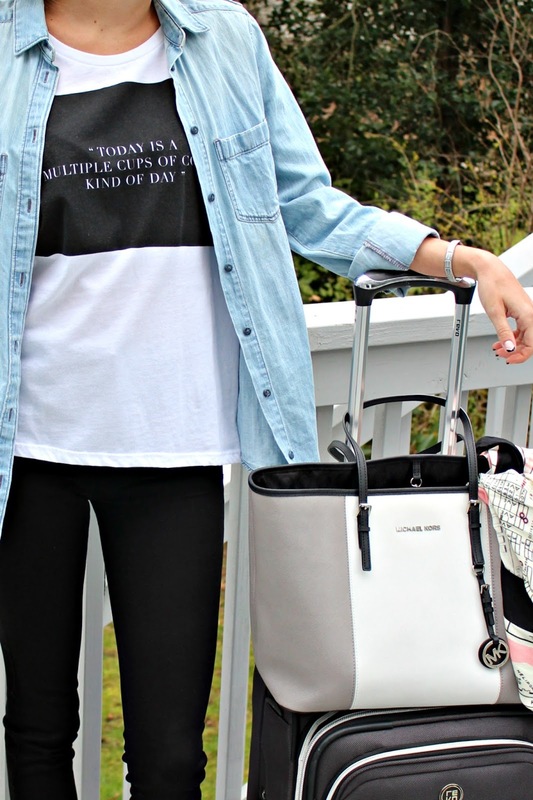 Perfect travel outfit -comfy & chic! I need that shirt of yours - I do have those days often! And that MK tote? Gorgeous! I love this top! I got it years ago, but linked to similar styles. Perfect travel outfit! Yes, totally agree with all of your tips. One time I wore clip in hair extensions through the airport and set off the metal detector... haha, so awkward! omgosh! Never even thought of those setting off the alarms! Obsessed with your overalls. They were too cute! My travel outfit is so similar to this - I need all of the comfy things! I'm always freezing on planes so I usually opt for a warmer sweater as a top layer (even when going somewhere hot). I'm obsessed with those shoes btw! So cute! Yes - for some reason planes are always freezing. Layers are a must.